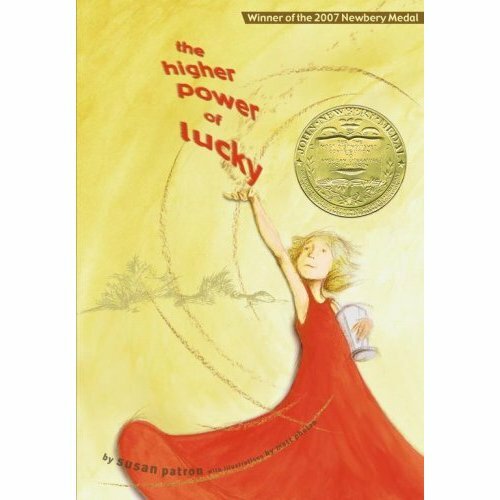 Read along with us as we read the 2007 Newbery winner The Higher Power of Lucky by Susan Patron. Meet Lucky, a ten year old girl who lives in Hard Pan, California (population 43) with her French guardian Brigitte and her loyal dog, HMS Beagle. Lucky manages to keep very busy in this small town – collecting bugs in specimen jars, writing about the terrible fate of the tarantula when it meets the tarantula hawk wasp, chasing snakes out of the clothes dryer and spending time with her quirky friends. But what occupies Lucky’s thoughts most of all is the worry that Brigitte may want to abandon her job as Lucky’s guardian and return to France because, unlike actual Moms, guardians can resign. Lucky hatches a plan to keep Brigitte in California . . .
Lisa This is actually my fourth time reading this book. And I still LOVE it! I’m so pleased you liked this book. I find it very special. What did you think about Lucky running away into the desert?